North Lake Tahoe is home for Amie Engerbretson. The skier, sports model, and video host travels the world—Canada, Japan, Alaska—for magazine covers, major advertising campaigns, and spots in ski films (Line of Descent, Pretty Faces). Yet when the cameras stop rolling and the microphones are silenced, it’s the pretty mountains on the north shore of Lake Tahoe that Engebretson heads for. Home to North America’s highest concentration of ski resorts as well as Lake Tahoe—the largest alpine lake in the nation—the region is graced with 12 ski areas, elite on-mountain recreation, and idyllic lakeside après. SNOW caught the vivacious, engaging, and highly skilled skier between photo shoots to ask about the offbeat activities she enjoys in winter in North Lake Tahoe. We also asked what she treasures most about coming home. Q: How long have you lived in North Lake Tahoe? A: I was born and raised in the Tahoe area. We lived in Squaw Valley when I was young and eventually moved to Truckee. I left for my college years, but the amazing beauty of the area combined with endless possibilities for activities and warm and friendly people drew me right back home. Q: What’s special about the region? A: For me, the stunning vistas and landscapes are amazing. Lake Tahoe is just so big, blue, and beautiful! Surrounded by rugged, granite-specked mountains, it is a true treasure. North Lake Tahoe also has so many possibilities to play in the outdoors in any season. The mountains, lakes, and rivers make it so you are never bored. Beyond that, this area attracts really great people. There is a sense of worldly adventure paired with a warm and inclusive family vibe. Everyone has one thing in common: a love for North Lake Tahoe. It is really special to be part of that. Q: You grew up in North Lake Tahoe with a famous father, tell us about that. A: I was raised in both Squaw Valley and Truckee. When I was young, my dad, Jeff Engerbretson, was a professional skier and we’ve always been really close. He opened my eyes to living an alternative lifestyle and to the importance of chasing down your dreams. Now he’s a cinematographer and photographer still based in North Lake Tahoe. He taught me to ski at 10 months old and I’ve been skiing for the camera (and for fun!) ever since. We get the chance to work together a lot. For us, family time is time outside. We are always skiing, mountain biking, or paddling. The North Lake Tahoe lifestyle is great! Q: The region is home to 12 ski areas, each with its own beauty and character. Why do you love skiing here? A: The entire North Lake Tahoe area has truly great ski terrain. The granite rock and steep slopes seem like they were designed for people to put tracks down. Combining great terrain with TONS of annual snowfall, it is forever my dream ski destination! Q: And when you’re not skiing, as a North Tahoe local what do you do for fun? Snowshoeing is a fabulous way to get out and enjoy winter here, even if you aren’t a big skier. Moonlit tours are amazing as it is truly unique to be out in the snow by moonlight—the light reflects off the snow. It’s gorgeous! During daylight, you could also try snowshoeing at Chickadee Ridge. Feed chickadees from your hands while snowshoeing through the forest—they’re so cute! Dog Sledding is super fun and unique. The dogs are so talented and they love what they do. It’s an exhilarating, once-in-a-lifetime activity. It’s never too late to learn to ski or ride. Whether it’s at Squaw Valley, Mt. Rose or Northstar—or any one of the 12 ski resorts on the north shore of Lake Tahoe—the feeling of freedom when you are gliding over snow is unmatched. 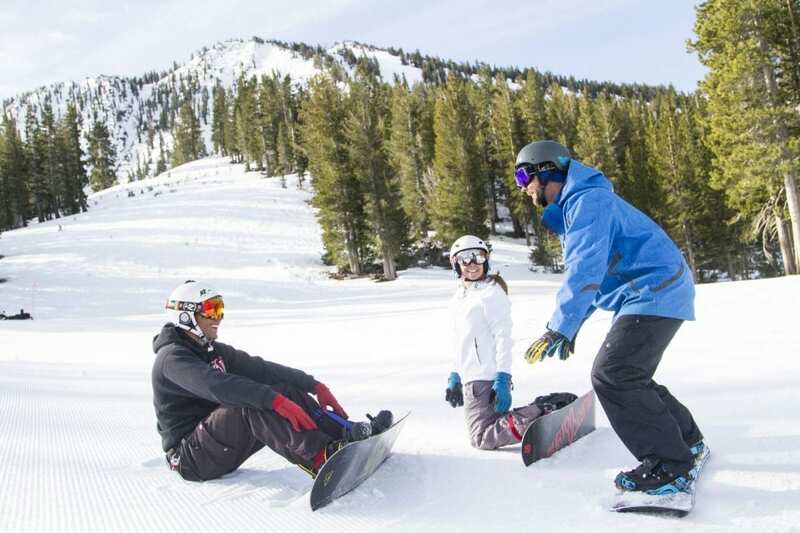 All the mountains have lesson programs that can help skiers and riders of any ability. Don’t miss an opportunity to try what I consider winter’s best mountain activity! Tahoe has amazing stargazing—don’t miss this opportunity if you can. You’ll gaze at the cosmos through the eyepiece of a Celestron telescope. On most nights you can see stars, galaxies, galactic clusters, the Milky Way. Plus, who doesn’t love s’mores? This is another treasured nighttime activity. Snow tubing is like sledding, only better. Add a DJ, a starry sky, lasers and LED lights, and you’ll be rewarded with a family-friendly spin down the tubing lanes you won’t soon forget. Enjoy an après beverage with a local Olympian, one like Jonny Moseley, Julia Mancuso, or Lila Lampanja. We’re very lucky that North Lake Tahoe has a lot of Olympians. It’s inspiring to run into them in “real life.” You’ll find that beneath the super-hero athlete is an approachable, down-to-earth person who loves meeting people and sharing smiles. Après with any Olympian is a true treat! If you are going to play hard you must treat yourself! I find these on-mountain spa treatments to be tailored to people like me—ones with sore muscles and in need of some real relaxation. “Find your true North” at Wanderlust Studio. From Vinyasa Flow to Yoga for Athletes, the Wanderlust Studio is an ideal place to unwind, rebalance, re-center. All instructors are knowledgeable and offer a variety of yoga styles, including Acro and Après Ski Flow. My favorite instructor is Sherry McConkey. Her practice is the perfect balance of stretch and strength to keep your body ready for fun activities in the mountains. Build a s’more and sip a hot après cocktail at one of the many stunning fireplaces in North Lake Tahoe. A cozy mountain classic with a gourmet twist! S’mores aren’t just for kids. Plus, anything bathed in firelight is a delight. Fat Biking is crazy and super fun! It is a thrilling way to get outside in the winter. Try it at Northstar’s cross country center, situated near the Vista Chair. Whether you are an avid biker or a beginner, fat tire biking is an exhilarating way to see the sights and laugh with your friends. Another winter classic! Ice skating just never gets old. I find any time I put on a pair of skates I feel like a kid again. Ice skating is always festive—great to do with kids and friends! The WinterWonderGrass music festival at Squaw Valley is an exciting new addition to winters in Tahoe. It’s live bluegrass music (Greensky Bluegrass, Alo, Trampled by Turtles) played under the sun and under the stars. Taking place in early spring, the festival’s slopeside concert setting adds incredible ambiance. The Alpenglow Mountain Festival showcases some of the best activities Lake Tahoe has to offer—backcountry skiing, splitboarding, cross-country skiing, snowshoeing, yoga. It’s geared toward beginner and intermediate snow enthusiasts, and almost all of it is entirely free!